One of the most widely circulated images during yesterday's Navy Yard shooting turned out to not be related to the shooting at all, but that couldn't stop it from being shared by thousands of Twitter users and many media outlets. Update Thursday, 9/19: On Thursday evening, the Associated Press re-released the photos discussed in this post, after determining that the images did, in fact, depict a scene related to the mass shooting at the Washington Navy Yard. One of the agency's reporters tracked down the entire story behind the scene, which explains how a victim of the shooting ended up on the sidewalk, blocks away from the Navy Yard itself. The AP's full story on those images is here. Original Post: One of the most widely circulated images during yesterday's Navy Yard shooting turned out to not be related to the shooting at all, but that couldn't stop it from being shared by thousands of Twitter users and many media outlets. There were actually two photos posted to Twitter yesterday by Tim Hogan that depicted a man on the ground surrounded by medical personnel in the area near the Washington Navy Yard. Because of the location and timing of the incident, most people, including the person who took them, assumed it was related to the nearby shooting. Today, a spokesman for the Associated Press* told The Atlantic Wire that the man on the ground was, in fact, unrelated to the shooting. Both Colford and Hogan expressed remorse at the actions that led to the error being picked up and spread by so many media outlets and Internet users. "We should have vetted the circumstance shown in these photos more carefully," Paul Colford, the AP Director of Media Relations, wrote in an email to The Atlantic Wire. Similarly, Hogan, a congressional staffer for Rep. Steve Horsford, said in a phone interview that he had some regrets on posting the image to Twitter. "If I could go back and re-do it, I would have put some clearer language in that initial tweet." In the midst of the hectic Washington Navy Yard shooting yesterday morning, Hogan posted two photos to Twitter at 8:59 and 9:06 that showed a man lying on the ground surrounded by medical personnel with the hashtag #NavyYardShooting. The pictures, which had been taken and texted to Hogan by his fellow congressional staffer, Don Andres, spread like wildfire from there, garnering almost 700 combined retweets; although the image itself (removed from the original tweet) spread even further. Soon, Hogan received tweets and calls from various media groups hoping to use the pictures in their live coverage. In subsequent tweets, Hogan tried to clarify that he and Andres could not confirm the relation of the photos to the shooting. "We made every effort to flag major outlets that were contacting us about it ... that we couldn't verify the status of the man in the picture," Hogan said in a phone interview. "We did our best to work with people to make sure the photo was in the right context." However, the AP later backtracked on the authentication of the photo, according to a timeline provided by Colford. At 1:05 p.m., the AP issued a new disclaimer with the photo. "Please be advised that the Associated Press is further investigating the details in these photos ... We are working to determine the circumstances surrounding the person's collapse," the message read. Almost five hours later, at 5:53, the photo was then pulled from distribution. A message went out in all-caps to outlets saying that the AP "HAS BEEN UNABLE TO CONFIRM" that the images were related to the shooting, and recommended the removal of the photo. Today, Colford explained that decision further. The problem wasn't just that the photo could not be confirmed to be related, but that the image desk decided that it was "unrelated to the violence at the Navy Yard," he told The Atlantic Wire in an email. Unverified and unrelated are two very distinct and important conclusions. The tweeter of those photos, too, expressed remorse about the decision to post the photos. His follow-up pleas to exercise caution received much less attention than the ones that were continually shared across social media. Andres, the actual photographer, later in the day spoke on MSNBC about taking the pictures while driving into work and spoke with some hesitancy about the reason that the man was on the ground. "I don't know what happened to the man, I don't know if it's related. All I know is that people just began running up to him and tending to him. ... I would say around where the man was laying down there was definitely panic as people were trying to get to work ... When I first saw the man no one was tending to him, and just in those two seconds a few people started running up to him. Maybe they were nurses or doctors and not at work yet or whatnot, but they were definitely tending to him. And I don't know exactly what happened to him but he was just on the floor, and it was just sort of unfolding right there." Though he took them near the shooting, the photographer did not know the exact relation of the photos to the actual events and victims. Still, the photos were quickly snapped up and passed around by many in the media, some with a disclaimer and many more without one. There were some warning signs about the relevance of the photos, especially to those familiar with the geography of the area. The CVS pharmacy in the background of the photo is a few blocks away from Building 197, where the shooting took place — 0.4 miles to be exact, according to Google Maps. How did a gunshot victim end up there? 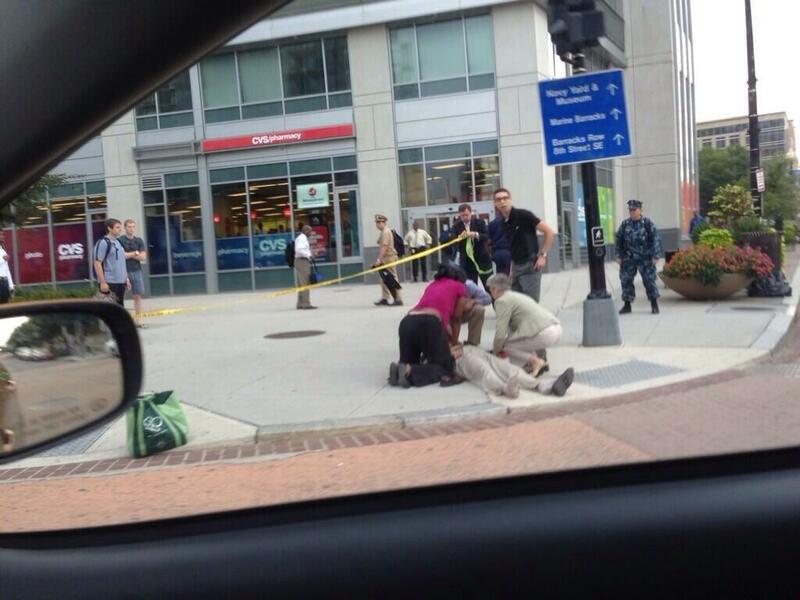 Mandy Jenkins of Digital First Media tweeted her doubts: "Still pretty confused as to how a wounded man was dragged to CVS from the Navy Yard, it's at least 3 blocks away." Other questions remained, as well: Why was there no sign of blood? Would people have picked up and moved a gunshot victim to the ground on a concrete street corner? One of the key questioners of the photo's relevance was none other than Reddit, the site who did some aggressive sleuthing during the Boston Bombing, much of it incorrect and potentially destructive. One of the photos tweeted by Hogan was placed on Reddit in a highly upvoted post titled "First victim of the Navy Yard shooting at the CVS one block away." But in the comments, the top-voted response attempted to debunk the photo. "I work one block from the yard- word of mouth is that this victim had a heart attack and is unrelated (except perhaps by stress) to the shooting," wrote user ACFCrawford. Hogan, too, speculated today that the man on the ground was likely suffering from a heart attack, but he was quick to say that he had no clear evidence to support that conclusion. Just like his original belief that it was related to the ongoing shooting, that's just a guess based on the circumstances. It's all just another example of the mistakes that can happen when you make those guesses in the heat of a breaking story, and dangerous of those mistakes spreading. Even when they are honest mistakes that turn out to be (this time, thankfully) harmless. *Correction: Originally this story characterized Hogan's quotes as concluding that the photos he posted to Twitter were unrelated to the shooting. As he is quoted in the piece, he said he did not know if the photos captured a shooting victim.